Home English Why all mantras are written in Sanskrit? Sanskrit is a very old language which cannot be dated for its exact time of evolution. It was a celebrated language of India, which is now a downgraded language and limited to some oriental colleges. For our wonder there are still some places in India where people speak only Sanskrit, not any other language. In fact Sanskrit is the oldest language in the whole world. The basis of all the European languages lies in the language of Sanskrit. Before the western world learnt civilization, India was dwelling with enchanting prosperity and huge development in various aspects like science, navigation, rich culture and social equality. Thanks to Sanskrit and the holy Vedas which are in the language of Sanskrit. 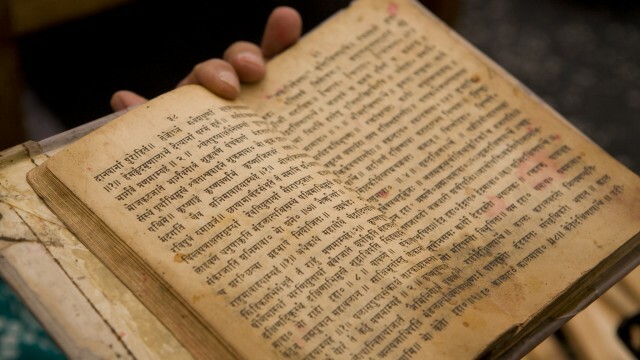 But why are vedas, mantras and all other stotras are written in Sanskrit? There is a lot of difference in the Sanskrit we know today and the old language. The pronunciation of Sanskrit words evokes mystic energies around. Those energy waves possess the power to cure vast kinds of diseases and mental ailments. The sound energy emitted restores the emotional bliss. This is not a superstition. It has been proved many times by modern scientists too. Many international schools abroad make their kids listen to vedic hymns and stotras before starting of daily classes. Sanskrit is known as the language of deities. This wonderful languages of such importance and holiness is now neglected in India where in other countries like Germany, Sanskrit is celebrated as the language of eternal knowledge. This is why every mantra or hymn and stotra is scribed in the holy language of Sanskrit. Do you know which fruit gives good nourishment to your brain?